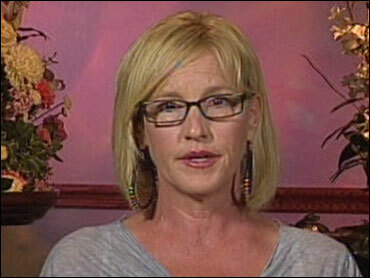 Erin Brockovich is back on the case again. In an exclusive interview on The Early Show Wednesday from Midland, Texas, Brockovich discussed contaminated water she says has been found in the town. And she had a jar of it with her to show The Early Show viewers. Brockovich said the area with the bad water is residential, and her team is working to identify all the homes that have problems and getting filters on their water supplies. But she said the process is becoming "very daunting, very quickly" because there are more homes affected than originally believed. And what does Brockovich say is in the water? A substance she knows all-too-well: hexavalent chromium. The same substance, also known as chromium-6, is what Brockovich found in the water in Hinkley, Calif.
Brockovich is now known for leading that investigation, which Julia Roberts made famous nine years ago with her Academy award-winning portrayal of Brockovich in the film named after Brockovich. "I never thought I'd see another Hinkley, California," Brockovich told CBS News in Midland, "but I'm afraid I might be wrong." Hexavalent Chromium, Brockovich said, is now being found in significant amounts in the water of over 40 homes in Midland. "The only difference between here and Hinkley," Brockovich said, "is that I saw higher levels here than I saw in Hinkley." Midland resident Kay Saythre knew something was wrong, and asked Brockovich to investigate. "We didn't really understand why the water was yellow when we filled the pool," Saythre said. That's when Saythre and her neighbors learned their water is contaminated. Saythre's next door neighbor, Sheldon Johnson, and his wife are experiencing health problems. They have both been diagnosed with kidney problems. "It's kind of odd that two members of the same household basically have the same problem," Johnson said. Both Saythre and Johnson now have state-monitored filters on their water supply. But the main concern for residents is finding the culprit. Bob Bowcock, an environmental investigator, believes the source of the contamination is Schlumberger, an oil field services company. The Early Show asked Schlumberger for comment, and the company said in a statement: "Chromium has not been used in any of the processes performed at the Schlumberger facilities in Midland, Texas, and independent water samplings indicate that the source is likely an adjacent site unrelated or our facilities." No lawsuits have been filed and the state is still investigating. For now, the Texas Commission of Environmental Quality has told residents its priority is to identify the contaminated sites and provide clean water for people with chromium-6 contamination. Brockovich said the immediate concern for people in the contaminated areas is for their children. "The children have so many unexplained problems," she said. "I sat down with a family ... and it was actually really heartwrenching. Their 7-year-old child has stomach tumors. They're very concerned that he had an unusual cancer ... and (the mother) is so frightened what the future holds for that child." She added, "...In the long term (residents are) all terrified that they could come down with cancer."